The Boulder Insulated Stainless Steel Water Bottle is our flagship thermal hydration vessel that will keep your drinks hot or cold all day long. Made from food grade 18/8 stainless steel and featuring our signature TriMax triple insulation technology, this vacuum insulated stainless steel water bottle is tested to keep liquids cold for 40 hours and hot for up to 12 hours. The Boulder stainless steel water bottle features a food grade stainless steel removable strainer for tea and fruit infusion. The strainer will also work well as an ice dam to keep your ice in the bottle instead hitting your teeth. The Boulder stainless steel water bottle includes a dual-use top with a wide opening for easy filling and a spout for easy drinking and pouring. For added versatility and value, the top is interchangeable with our push-button coffee top and flip spout sports top which are offered separately. The two-piece lid includes an integrated carrying strap and its secure leak-proof seal will keep your drink inside the bottle where it belongs. It’s available in a variety of colors and styles in our durable powder coated finish or in a stainless steel finish. Your bottle won't sweat and will fit most cup holders. 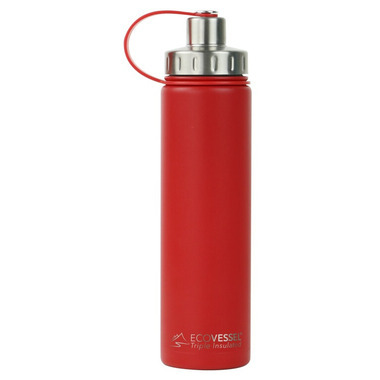 Toss this insulated stainless steel water bottle in a tote bag, bring to yoga or hit the trails. Whether you are at your desk or running errands around town, the Boulder will keep you hydrated.